Khabib Nurmagomedov was the calm, glowering foil to Conor McGregor’s antics for six months as the loquacious Irishman built a frenzy of hype around their UFC lightweight title fight. When Nurmagomedov forced the biggest star in mixed martial arts to tap out on Sunday afternoon (AEDT) to end what’s likely to be the most lucrative show in UFC history, he had fashioned the perfect response to McGregor’s verbal insults and physical attacks. “These guys are in big trouble,” UFC president Dana White said. 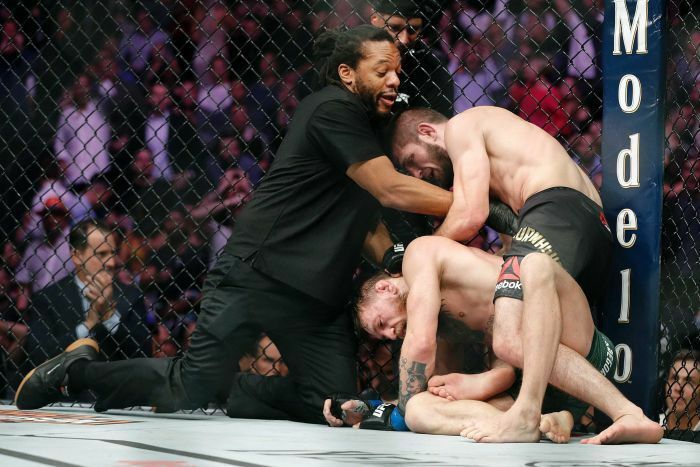 Executive director Bob Bennett said the Nevada Athletic Commission intended to file a complaint following its investigation into the actions of Nurmagomedov and his team for setting off a post-fight melee at UFC 229 immediately after McGregor submitted to Nurmagomedov’s choke in the fourth round. Nurmagomedov’s $US2 million purse has been withheld, and he could face a hefty fine along with a lengthy suspension. “There’s going to be fines,” White said. “There’s going to be God knows what. Can these guys get visas to get back in the country? McGregor’s $US3 million purse was not withheld after commission officials examined video footage and determined his side had done nothing wrong in the melee. 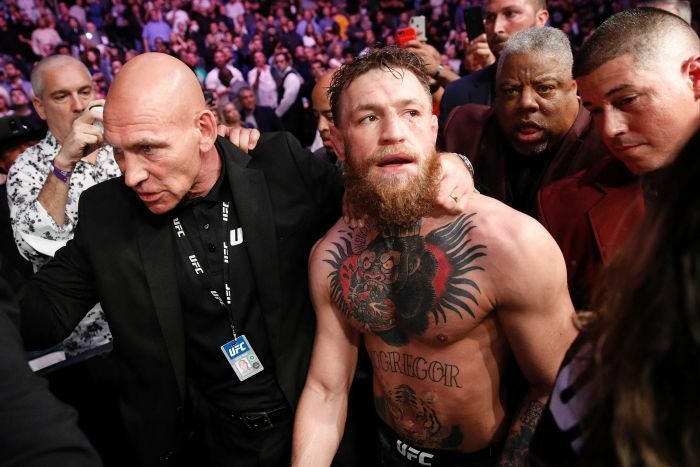 While Nurmagomedov brawled with McGregor teammate Dillon Danis outside the cage, a few men from Nurmagomedov’s camp — at least two of whom appeared to be UFC fighters, although the promotion and the commission haven’t formally identified them — climbed into the cage and confronted McGregor, who defended himself while getting sucker-punched from behind. By following his masterful victory with a reckless response to McGregor’s lengthy campaign of verbal and physical aggression, Nurmagomedov showcased the best and worst sides of mixed martial arts in a 30-second span. The Dagestan native who trains in San Jose, California, also overshadowed his years of steady progress to become one of MMA’s top pound-for-pound fighters. But Nurmagomedov said he had been brought to a boil by McGregor’s behaviour since April, when McGregor infamously attacked a bus carrying Nurmagomedov and several other UFC fighters. McGregor was incensed after Nurmagomedov confronted a member of his team in New York earlier that week, which ended with Nurmagomedov winning the UFC 155-pound belt. 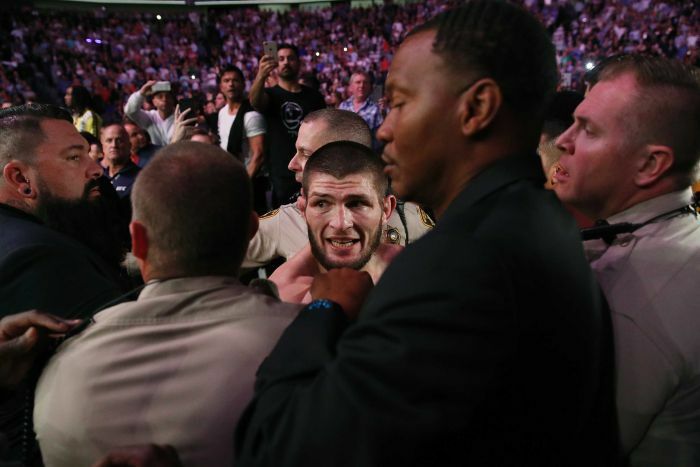 “I don’t understand how people can talk about I jump on the cage, you know?” Nurmagomedov said after apologising to the Nevada commission during a brief post-fight statement to reporters, his title belt displayed on the dais before him. “What about he talked about my religion, he talk about my country, he talk about my father? He come to Brooklyn and he broke bus. He almost killed a couple of people. After McGregor agreed this summer to return from a 23-month UFC absence for this highly lucrative bout, Nurmagomedov absorbed the Irish superstar’s gleeful taunts related to his family, friends and Muslim faith during their fight promotion. McGregor crowed when Abdulmanap Nurmagomedov, the champion’s beloved father and a longtime wrestling coach, couldn’t attend UFC 229 because he couldn’t secure a US visa in time. McGregor called Nurmagomedov’s father a “quivering coward” during a boisterous news conference. On Thursday, McGregor referred to Nurmagomedov’s manager, Ali Abdelaziz, as a “snitch terrorist rat”. McGregor appeared to be referring to a book written several years ago that claimed Abdelaziz once worked as an informant for the NYPD and FBI among US Muslims in the wake of the September 11 terrorist attacks. White was at Mike Tyson’s fight with Evander Holyfield in 1997 when Tyson bit Holyfield’s ear and went on a rampage that spilled into the stands. The UFC 229 scene also recalled Floyd Mayweather’s fight with Zab Judah in 2006, in which the fighters’ trainers brawled in the ring between rounds and nearly set off a riot; the post-fight fracas between entourages and fans at heavyweight champion Riddick Bowe’s fight with Andrew Golota in 1996; and a Strikeforce MMA show in Nashville in 2010 that ended with a post-fight brawl carried live on CBS. “I promise you this is not what a mixed martial arts event is normally like,” White said. Although White said he was “disgusted” by McGregor’s behaviour in Brooklyn, the UFC promoted this bout using video footage of McGregor’s violent attack, which traumatised strawweight champion Rose Namajunas and left two other fighters unable to compete due to injuries from the shattered glass. When asked about the UFC’s exploitation of the bus attack, White said he would do it all again, calling it “part of the story”. Arash Markazi tweets Conor McGregor being escorted out of the Octagon. UFC 229 shattered the promotion’s previous gate record with $US17.2 million ($24.38 million) in ticket sales, and White expects the pay-per-view sales to break the promotion’s record as well. That massive audience saw Nurmagomedov put on a beautiful display of well-rounded fighting against the biggest puncher in MMA.